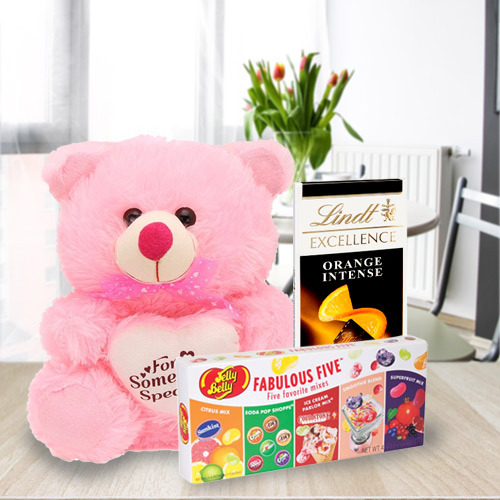 Gift online this Mind-Blowing Tempting Chocolate Hamper Delight and create an extremely joyful moment for your dear ones. This delightful Combo is combined with Jelly Belly Fabulous Five, 1 Lindt Excellence Chocolate Bar and a Cute Teddy Bear. Flowers Delivery Goraya, Send sweets Valsad, Wedding Cake Shimoga, Diwali Mithai Hazira, Send Flowers and Gifts to Gurgaon, Online Shop Muzzaffarnaggar, Flower to Taran Taran, New Year Flowers Ernakulam , Fresh Fruits Kanchikacherla, Send Gift Munger, Dry Fruits to Raichur, Birthday Delivery Bangalore, Sending to Amravati, Flower shop Navi Mumbai, Ernakulam Online Cake Delivery.